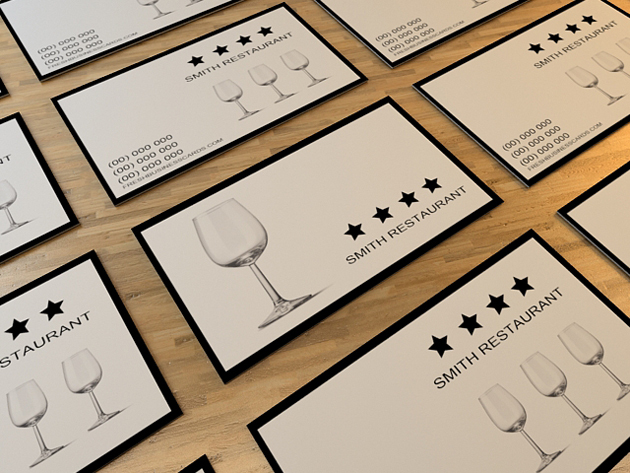 Restaurant business highly depends on qualitative advertisement from satisfied customers. The first thing that comes to mind when you think of a restaurant business card is obviously food. If you have a restaurant, catering, bar or any business that offer exclusive food, this business card is for you. Restaurants can also increase their business by sending out Happy Birthday cards with a voucher inside. This can be designed, signed and snail mailed all from the computer for less than $1 plus postage, to grow your business through customer relationship management. Everyone likes to be remembered and receive a real greeting card in the mail. Happy birthday cards are a good idea provided you have captured the relevant data! The stars are good, perhaps if the restaurant has lots of great reviews on tripadvisor or something, they could detail it here and really make the most of those reviews and the star rating!